Indy Ford F150 1979 Pace Trucks. 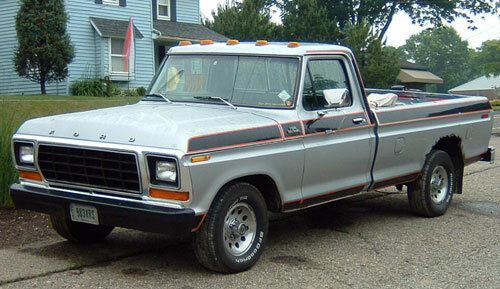 These are pictures of Ford's 1979 Official "Pace" Truck for the Indianapolis 500 track. These are rare trucks today. Few are left. Ford's own 1979 product brochure does not even mention this optional package. Some people have sent me some pictures to share more information and restoration help. I would be interested in adding any pics or information you may have! Please contact me. Click here for Page Two of these trucks. These photos above were sent to me courtesy of Steve M. of his own Pace Truck. This is an excellent example, because it still retains the original factory roll bar and Ford wheels. 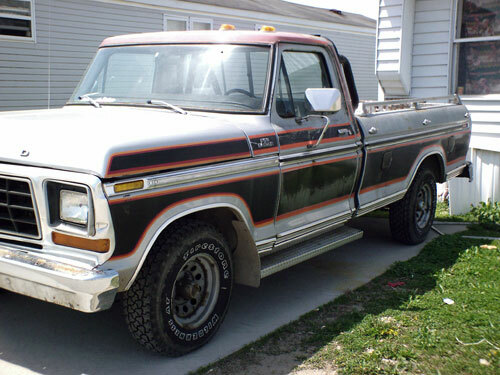 "The truck has a 302 with automatic showing 74,000 miles. The raised outline of the "Official Truck" decal is still visible on the doors. From what I could tell, most of the removed trim pieces and park lamps are laying in the bed of the truck. The tailgate has major damage as you can see in the photo." 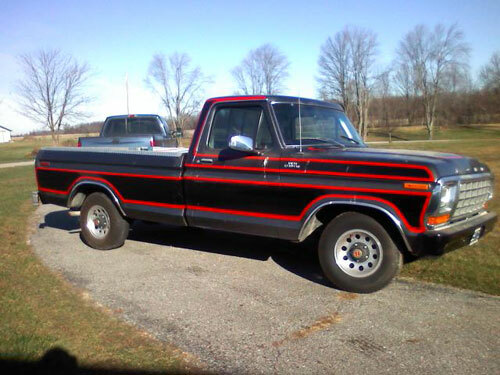 Don recently purchased a 1979 Ford F150 that the previous owner claims is an "Indy Pace Truck". My paint scheme looks different than those pictured on your website. I've included a picture for your viewing. Feel free to pass it around along with my e-mail address to anyone who you think can help me. Thanks in advance. 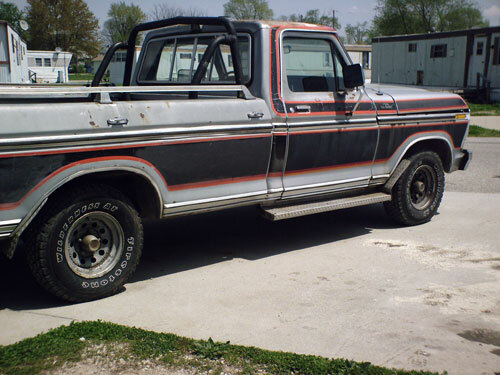 Don bought this Pace Truck for only $ 300.00. It still retains the factory black roll bar. Bill S. redid his F150 Pace Truck back in 1997. The door panel. Notice the orange trim work. Front seat gray and black with orange trim. Pace truck dash board and steering wheel. gracious permission of other websites. A magazine ad for the Pace Trucks. © Rocketfin Hobbies All Rights Reserved 1997-2018. No duplication is allowed in whole or part. All graphics and designs are copyrighted Rocketfin or the respective end Clients & Associates.